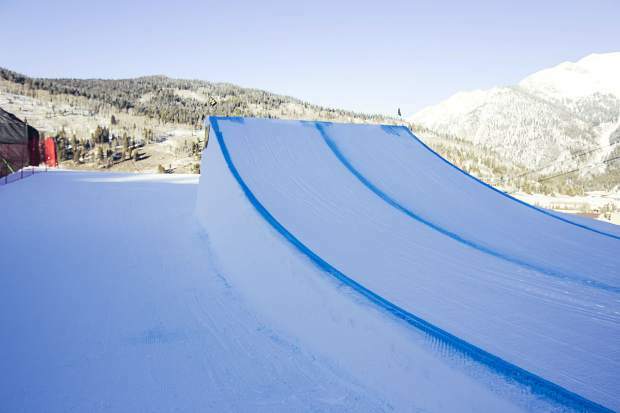 Ramp for the U.S. Grand Prix Big Air competition at Copper Mountain. Four American men and two women qualified at Copper Mountain Resort on Friday for Sunday’s Snowboard Big Air finals at the Toyota U.S. Grand Prix FIS Snowboard World Cup. Japan’s Yuri Okubo registered what was by far the most impressive score of the day, a 94.66 on his second run, which featured one 97 from judge Iztok Sumatic of Slovenia. Three other competitors scored in the nineties Friday, including the second overall score posted by Chris Corning of the United States (92.33). Max Parrot of Canada won his heat with a score of 90.00, the same mark tallied by Heat 2’s third place finisher, Peetu Piiroinen of Finland. Norway’s Mons Roisland finished second in Heat 1 with a score of 86.66 to also qualify for Sunday’s finals. Also qualifying from Heat 1 were Jonas Boesiger of Switzerland (85.66), Rene Rinnekangas of Finland (83.33) and Chandler Hunt of the United States (81.00). Sunday’s final is scheduled for 11 a.m. to 12:30 p.m. at Copper Mountain, the final event of this week’s Toyota U.S. Grand Prix. A pair of Americans were the final two snowboarders to qualify from Heat 2, Judd Henkes (89.00) and Ryan Stassel (88.66). Eight women in total qualified for Sunday’s final, led by Japanese teammates Yuka Fujimori (92.00) and Reira Iwabuchi (90.00), who topped Heats 2 and 1 respectively. Julia Marino may be the American best suited to take down the two Japanese leaders on Sunday, as Marino posted the third highest score of the day (89.33) to finish in second in Heat 2. Also qualifying from Heat 2 were Cheryl Maas of the Netherlands (89.00) and American Jamie Anderson (83.66). Sina Candrian of Switzerland finished in second in Heat 2 with a score of 87.66, while Silje Norendal of Norway (78.66) and Sarka Pancochova of the Czech Republic rounded out the qualifiers. This week’s event is an Olympic qualifier for American Big Air athletes, as the sport will make it’s debut at the Pyeongchang Games in February. 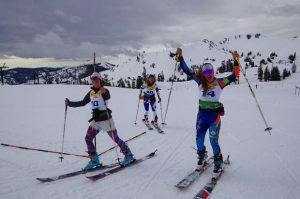 In order to qualify for the Olympic team via the objective criteria, athletes will need to have at least one podium finish against the competition field in the selection events, such as this week’s competition at Copper. If three or fewer athletes meet that criteria, those athletes will automatically be named to the Olympic team. 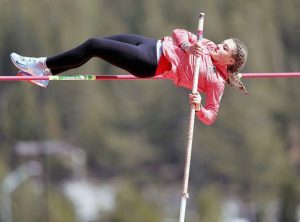 If four or more athletes have at least one podium finish, then those athletes will be assigned ranking points based on their two best results from the selection events.